Note: Contacts records are stored within our system using the email address as the key. A single record per email address is stored per account. Email address and all standard contact fields are are stored at the account level. This means that changes to the standard contact fields of an existing contact will be made globally wherever the contact is present. For more information: http://help.surveygizmo.com/help/article/link/global-vs-campaign-contact-fields. 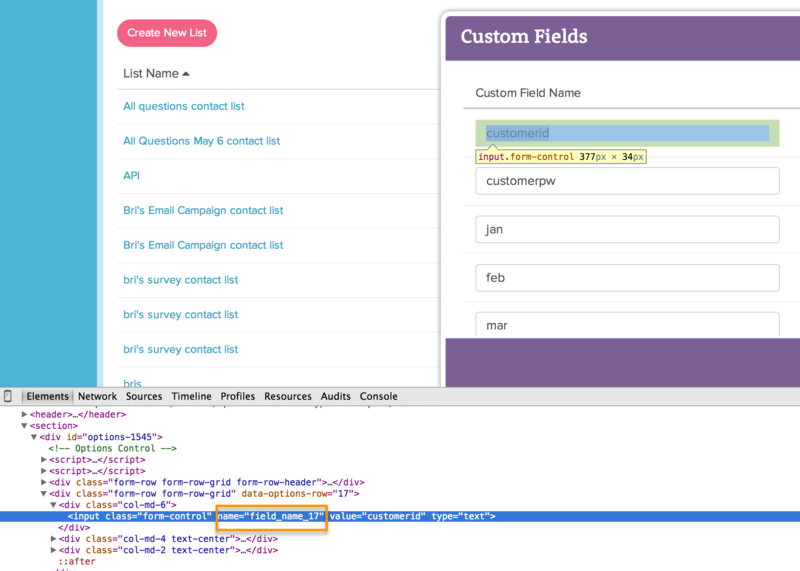 Go to Account > Email Lists and click the link to Manage Custom Fields in the bottom left. With a web-developer tool installed on your browser right click on the desired field and click Inspect Element. This will give you the details for this field. What you are looking for is the name field. It will look like the below. The number is all you need for either a PUT or a POST.